A number of legal scholars, experts, and researchers discussed updating and modernizing the Palestinian Legal and Judicial System - “AL MUQTAFI” - the first legal databank in Palestine, designed and developed by the Institute of Law at Birzeit University - in a workshop organized by the institute together with the Sawasya program on Saturday, January 26, 2019. Mohammad Khader, a researcher in the Institute of Law, stressed the importance of modernizing and updating the Palestinian Legal and Judicial System, and noted that a series of workshops will focus on improving and overhauling the system in four main areas: general policies concerned with the content and the relation with the partners, users, and supporters; the design and content of the legal database, including legislation, verdicts, and consolidated texts; the software used in the legal database; and the methods by which databases can be updated in Palestine despite the legal and political challenges. 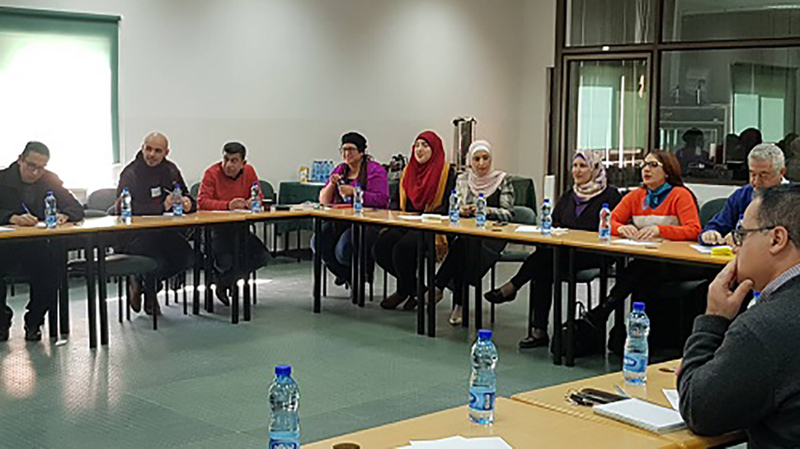 Abdelrahman Hamarsha, the database administrator in the Institute of Law, gave a presentation on the Palestinian Legal and Judicial System’s databases and their upgradability, and the system’s registration and access policy. The Institute of Law had previously signed an agreement with the United Nations Development Programme to support the Palestinian Legal and Judicial System under the Sawasya program, which seeks to support the building of a progressively functioning and increasingly inclusive Palestinian rule of law system that respects, protects, and fulfils human rights and gender equality and promotes peace and security.